When you’re bringing home a baby, often your thoughts are consumed with products that are designed to keep baby safe, warm, dry, and comfortable. We spend hours looking at cribs and researching car seats and safety ratings. With so much information out there, it’s easy to feel overwhelmed! It’s no wonder that many of us can forget about an important safety hazard right in the nursey — corded blinds. Standard blinds with cords pose a choking or strangling risk that many parents don’t think about since they seem out of reach or uninteresting. However, exploring children can find most anything interesting and they are incredibly inventive when it comes to reaching things that are supposedly out of reach! The sad truth is that about one baby every month dies due to cord strangling. While there are products that can help you tie up your corded blinds, there’s a surefire way to ensure that your child won’t get caught in the cords of your blinds: remove the cords altogether with cordless blinds. Cordless blinds are a great alternative for anyone worried about tangling in cords from standard blinds. This type of window treatment provides a great alternative for anyone who has a new baby or even a new pet. With cordless blinds, you won’t have to worry about choking, strangling, or a child pulling the blinds out of the wall and onto themselves. In addition to the safety benefits of cordless blinds, you’ll also enjoy the consistently smooth operation of cordless blinds. No more tangled cords, no more blinds that raise on one side and not the other. 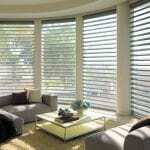 For questions, tips, and advice on cordless blinds, be sure to give our experts at Ashtons Blinds a call today.